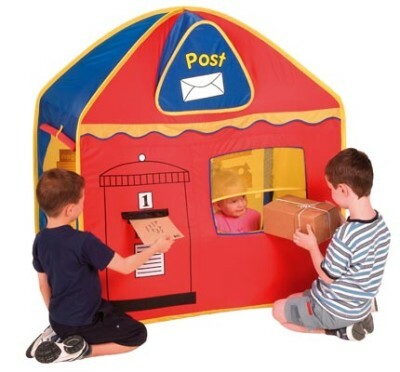 This fabulous pop up play tent is a Post Office and Corner Shop in one great toy – one side a post office and the other side is a corner shop. It is guaranteed to keep them busy for long periods of time as they play make believe in their very own shop and post office encouraging role play and learning. 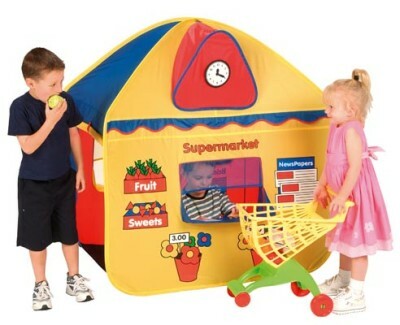 Idle for both indoors and out, girls and boys alike will love this fantastic pop up play house. Ground pegs and carry case included. It also look brilliant in its bright and vibrant colours and can be popped up or down in less than 10 seconds (with a little practice) meaning you can store it easily and can set it up anytime your kids want to play. It pops up in seconds; there are 2 poles to keep it steady which also only take seconds to put in. Post and Supermarket sales window. Folds down into a circle bag with carry handles. Comes complete with fixings. Toys and accessories not included.